Family and friends are looking for a Dickinson County man who went missing a week ago. 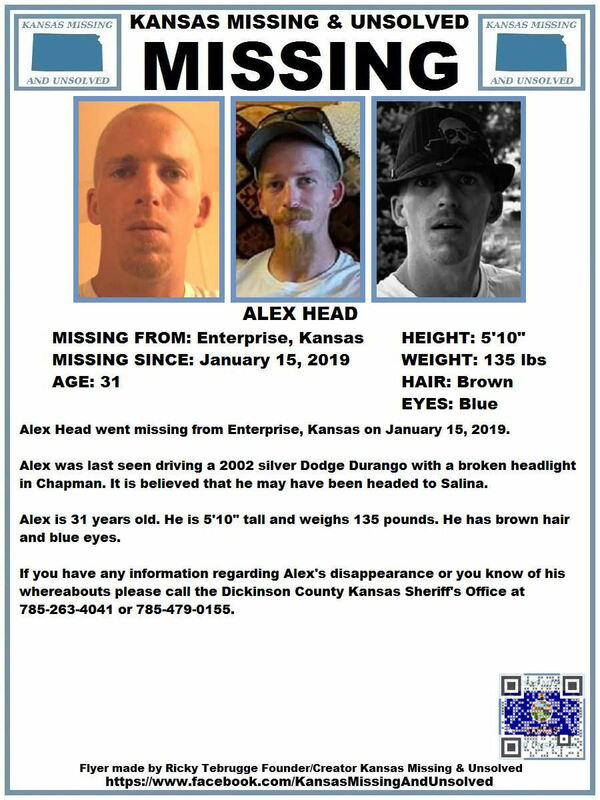 Kansas Missing and Unsolved tells KSAL News 31-year-old Alex Head of Enterprise went missing last week on Tuesday, January 15th. Head is 5′ 10″ tall and weighs 135 pounds. Head was last seen driving a 2002 silver Dodge Durango in Chapman, possibly heading to Salina. The vehicle had a broken headlight. Anyone with any information on where Alex Head might be is asked to contact the Dickinson County Sheriff’s Office at 785-263- 4041 or 785-479- 0155.